Solve puzzles by bouncing colored bubbles into each other to make them PoP! This novel game has 50 levels to entertain with tests of skill and puzzles to solve. You control a white bubble with your mouse, and by bouncing your White bubble into other bubbles, you can cause other bubbles to bump and PoP. Bumping similar colored bubbles makes them pop, but bumping different colored bubbles together creates a new bubble. ...... The idea is to clear each level of bubbles before the sand in the hour-glass runs out. 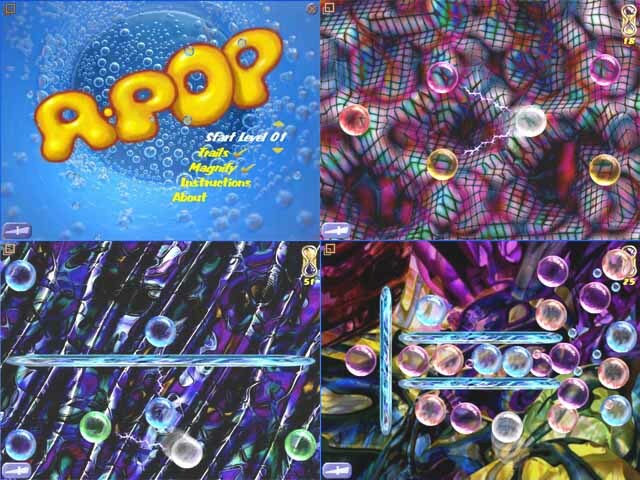 There are other features to add to the game-play, such as barriers, spikes, force fields and springs connecting bubbles together. Each obstacle adds an interesting twist to the solution of the puzzles. The backgrounds are beautifully rendered and the music is serene and relaxing. Afree- trial version of the game is available to download, the trial contains the first 10 levels of the full game, 9 are easy introductory levels, and one is a more tricky puzzle. Popcorn Screen Saver makes your desktop fill with Popcorn. You got bored from silly popup's annoying you while you are browsing the net. Qweas is providing links to A-POP 1.0 as a courtesy, and makes no representations regarding A-POP or any other applications or any information related thereto. Any questions, complaints or claims regarding this application A-POP 1.0 must be directed to the appropriate software vendor. You may click the publisher link of A-POP on the top of this page to get more details about the vendor.